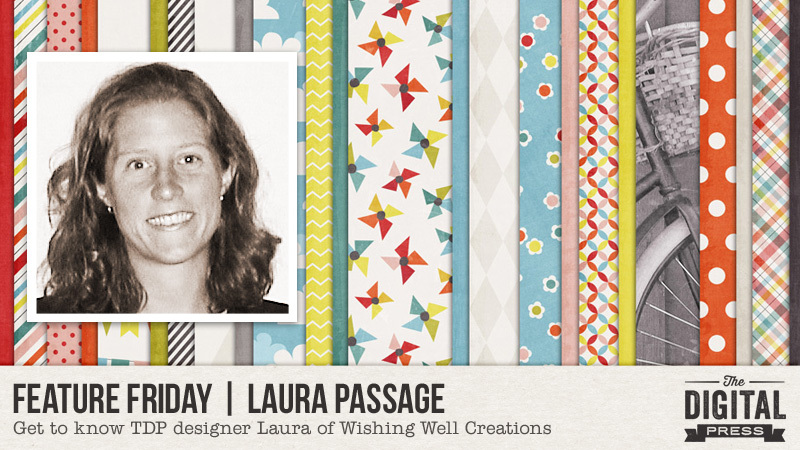 This week, we’re excited to feature the designs of Laura Passage (known to many of us as Wishing Well Creations by Laura Passage, or just WWC). Laura is not only a designer at The Digital Press, but is also our fearless leader! As a designer who also works in the paper scrapbooking industry, designing for companies like Echo Park Paper Company and Carta Bella Paper Company, Laura creates digital products that also have a distinctly paper-ish style and feel. You’ll find lots of flat stickers and icons in her kits, mixed with the types of dimensional items you tend to find used on traditional paper scrapbook layouts — stuff like wood veneer, string, staples, paper flowers, etc. Her kits are always bright and colorful and fun to work with. I live in the Pacific Northwest (about 45 min south of Portland, Oregon in Salem — the state capitol). When you’re not designing, what do you do with your time? I sort of “unexpectedly inherited” full ownership of The Digital Press this past winter, and for the past few months my design time has been really limited while I have focused most of my time on expanding and updating the site (and there are lots of really fun new things on the way to The Digital Press this year!). When I’m not doing that and/or trying to find time to design fun digital or paper goodies… I like to (in no particular order) go sit on the sidelines and cheer on my kids during their sporting events; cook and bake; read good books; binge-watch my favorite series on Netflix or Hulu with my husband; and sleep (although I really don’t do that very much! haha). What are 5 tidbits of trivia that we might not know about you? —Before I had kids, I worked as a college soccer coach for about a decade. —My favorite place in the world is the mountains of Colorado. I lived there when I was a kid, and nowadays as an adult even just the act of driving through that area calms me and centers me and makes me happy. —I’m kind of obsessed with rainbow colors. The clothes in my closet are even hanging in rainbow order, because it just seems happier that way. —My computers are all PC-based (and that isn’t going to change, because I keep buying PCs every time I need to upgrade — which I actually just did a month or two ago)… but I am totally an Apple snob when it comes to phones and devices. So yeah, basically, I am a walking contradiction and I know it makes no sense haha! —I have had a love affair with paper goods my entire life. When I was 10 or 12, I would save up my allowance and spend it on pretty patterned paper stationary and matching envelopes… and then that stationary would seem too nice to actually use, so I would just hoard it. This info completely and totally explains my craft space in my home office, which is overflowing with patterned paper and other gorgeous crafty stuff. I mean, washi tape, people. Right?! I have a giant collection of it just because it’s so pretty. 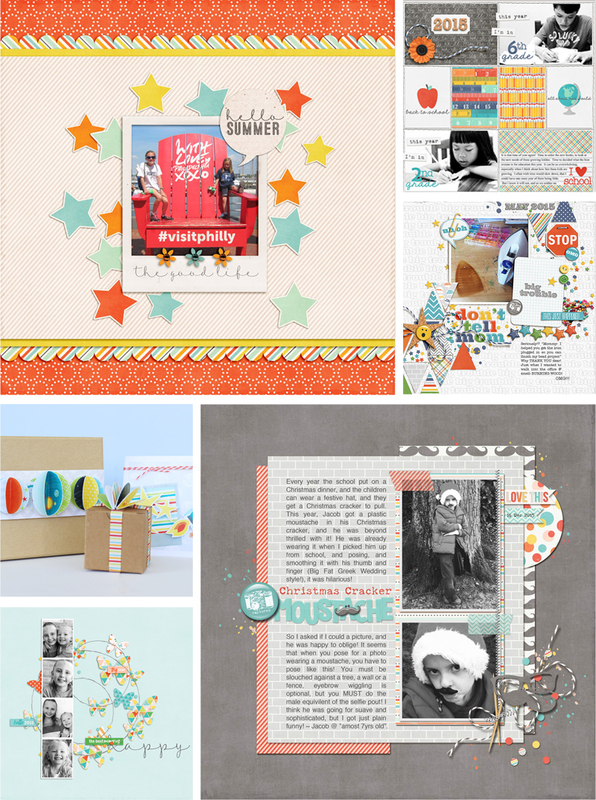 If you love fun color and papery goodness, you need to be sure to check out Laura’s products in the shop! 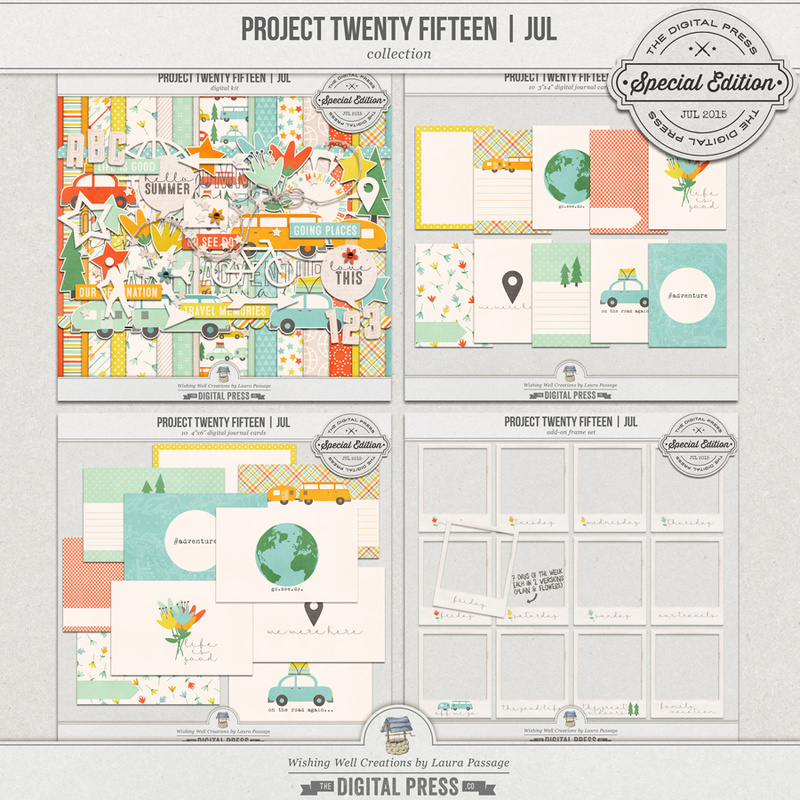 My personal favorite item of hers is her Project Twenty Fifteen Template Bundle. 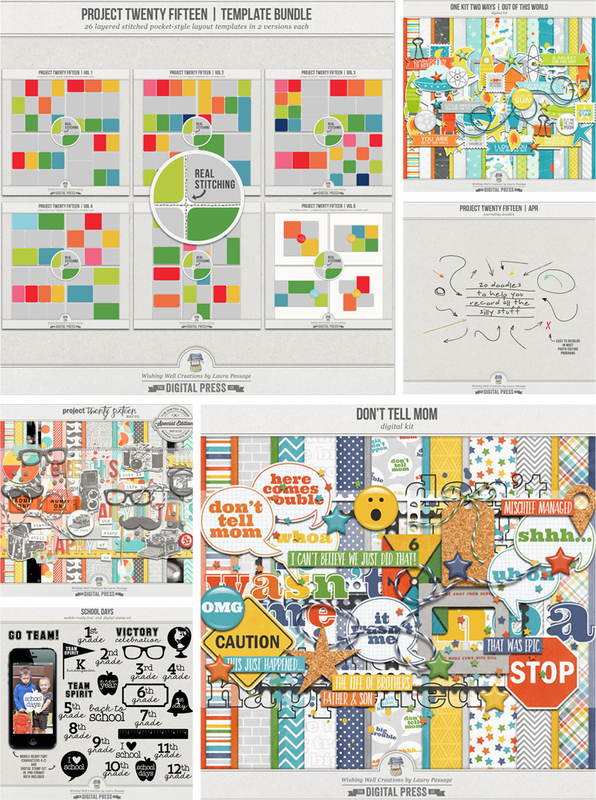 These templates are my go-to templates for all my pocket scrapbooking layouts. With real stitching in both black and white, and tons of layout varieties, they are the templates I turn to when I have lots of photos to include on a page. They are a pocket scrapper’s dream come true! Be sure to head over to Laura’s shop at The Digital Press this week for an amazing 30% OFF SALE on all of her products. (sale runs through 11:59pm ET on Thurs 7/28). You can pick up some of those amazing templates… or anything else that suits your fancy! I do have one question for the expert: please tell me why I should have Lightroom. I have used Photoshop since 97 & not unhappy with it – just want information: what are the benefits? Thank you. Hi Vianna! Good question. I resisted learning LR for the longest time as PS did everything I needed it for. And if you are happy with PS then you can just stick to it. I can’t think of any specific function then you can do in LR that you cannot do in PS …..but I have to say that the organisation tools in LR and some of the editing tools are much more easier and faster to use in LR. Also, I like the fact that every step in LR is non destructible. I know, no matter what I do – my original is my original and every step therein. Hope you find it useful too. Do let me know if you have any further questions.